I am currently working on getting kicked out of every room in the house as I try to start this post. and then he buzzes right by me! He even lands on my head!!! He is making me crazy!!! new students, students withdrawing 15 mins before dismissal, PTC,a college student observing, benchmarking in the building- so I have NO AIDES. I miss them. I love them. I will tell them I love them when I see them again tomorrow. Oh how I hope I see them tomorrow. We did manage to get some great reading done! And I am not talking about just me. It's them, too! They are reading like crazy! They can't wait to come to me on Monday morning and "cold read" and then they read throughout the week. And then Friday they come back for the BIG "hot" read- and man, they are excited!!! I had parents come in at PTC and tell me how excited they are that their child can't wait to read with them at night. "WHAT ARE THEY READING, SQUIRRELS!???!?!??!?!" (Well, if you'll quit yelling at me, I'll tell you). I have started including fluency passages on the back of their newsletters. The week before they appear on the newsletter, the students "cold read" them with me. They aren't for a "grade" or any type of testing like DIBELS ORF- but they are a great assessment tool for me!!! I included three of them this week- one is sort of a rhyme, one is non fiction, and the last is sung to the tune of a familiar song. When parents came in Thursday night- they couldn't stop talking about them! "WHAT ARE THESE FLUENCY PASSAGES??? WHERE DID YOU GET THEM???" (You are really going to have to keep it down, some of the Littles are already in bed). 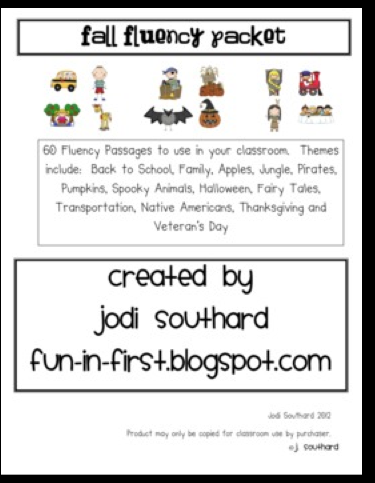 They are from Jodi's (Fun in First) Fall Fluency Passages. We had a themed week of apples this past week- and it was great to have these little reading selections to supplement all of the trade books we used! One particular passage we dissected- writing each sentence in different color Scentos Marker onto sentence strips. (love those things- makes the room smell like Fruit Salad) Then I placed them in five spots around the room and they raced to put them together again! Man, they were excited! Especially because they had practiced them so much! Not only are we just reading them- we are really working with them!!! There are vocabulary words and comprehension and phonics activities to go along with each passage!!! Each passage also includes a seperate page of language arts skills. AND they are matched to CCSS! Check out Jodi's Tpt store for examples of them! You will LOVE them! We had a wedding this weekend. A chance to polish up my Squirrels and take them out in public. The oldest son wins for "most polished" this time around. I LOVE love love that he wanted the bowtie! Littlest Little was ring bearer- so he was all decked out in a tux. The rest of us were as pretty as peacocks, too! You are too sweet! I'm so glad you like them!!!! They are making a HUGE impact on my sweeties!!! hahahah I love the photobombing!! TOO funny!! Version 1) Chickadee tries to block the shot. Version 2) Other two Littles run through. Version 3) the Actual picture. Bowties are cool. Great picture! I love that the parents were excited about the reading passages...that happens about never in my school. I will definitely share your idea of cold reading and putting them on the newsletter with my teachers. i don't give them their newsletter until the end of the day on Monday. The first thing they did today was flip them over really fast to see what the reading passages were! I love it! I love reading your posts! I am intrigued with your fluency reads sounds like something that would work in my room. Love the bowties! Thank you, Jessica! They are Reading Rockets right now! I have got to check out Jodi's fluency passages. Squirrels eat my sweet potato vines?!?! I get a kick out of the search keywords for your blog lol. I have no idea how they actually get directed here- I hope they find what they are looking for!!! Hi -- you are cracking me up!! I need to check out your shout out to Jodi - looks good. Your son looks great to BTW. It's amazing they can clean up well can't they?!? Have a great Monday! Glad you got a giggle:) Within two hours of that photo he was in baggy shorts and a stained shirt- thank goodness I got a picture! They are so excited on Thursdays and Fridays! I love those fluency passages. I am so glad I found them! wait....WHAT is that photo thingy going on in your post??? love it!! I love the GifBoom...so neat! I too thought the photo bombing was fun. :o) I am glad you got some lovely photos along the way. Weddings are always one of those things that make for great memories. Love me some Jodi Southard! Happy to be your newest follower! Next we need your help...please visit our blog for our latest post...No More Running Records!!! Really? GR is out the Door with Common Core!!! We are really looking for opinions from teachers especially first grade. We would be at debt to you if you would add us to your blogs so we can generate more comments from first grade teachers! 10 FREE items and WINNERS!! Day 3 -Winners and Prizes!! Day 2 of My Celebration!!! Shut the Front Door- 500 Followers!